Applications: Non-woven abrasive flap wheels are widely used for light de-burring, cleaning and finishing applications across a whole range of industries. They will give gentle action to provide surface finishing with minimal risk of gouging. Use for light scratch removal, removing grind marks and leaving parallel line finishes, such as satin finish, in metal such as stainless steel. 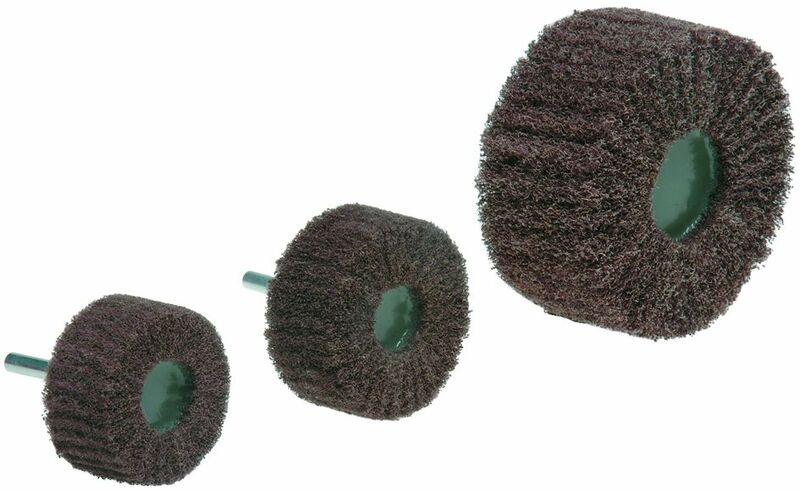 Made with flaps of non-woven abrasive with suspended abrasive grain to give gentler finishing action. Select Medium for cleaning and light coatings removal, with a brushed finish. Select Fine for removing scuffing and light scratches, with a fine brushed finish. Select Very Fine for satin finishing. Speed ratings: 30mm 18,500rpm. 50mm 13,500rpm. 60mm 11,500rpm. 80mm 8,500rpm. 100mm 6,400rpm.